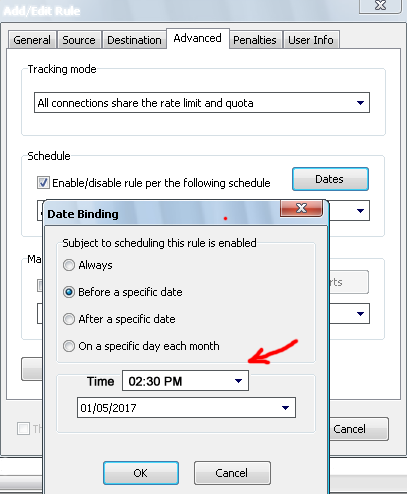 Can you please add (Time) with date at Rule Schedule? 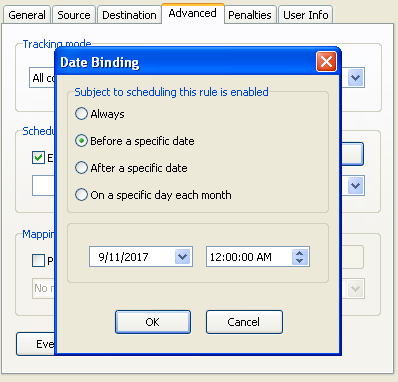 I need to disable a rule after a specific date and specific time, with current implementation it's just disable that rule at 12:00 AM of that date. I attached a photoshopped screen shot of what I need. Sure, I think we'll be able to include this in the next release. Thanks. when you gonna add it ?? Apologies for the overlook. Please try this latest build, which includes the time setting, and let me know how it works for you. It's working great as it should, i tried some test rules, time Schedule working fine. And changed Schedule of about 400 rules at different times/dates, BWM works stable as usual.